A shower hose will generally be flexible and may sometimes be referred to as flexi hoses. They can be found in a variety of colours including chrome; typically the most popular option, as well as gold, black and white. They're manufactured in a range of materials including stainless steel shower hoses and easy clean, PVC shower hoses. Whether you're in need of a shower hose for your new shower or your old one is worn or damaged and you now require a shower hose replacement, you'll need to ensure you have the correct hose length. Shower hoses range between 1.2 meters and 2 meters in length with various sizes in between; 1.25m short shower hoses, 1.5m and 1.75m long shower hoses. 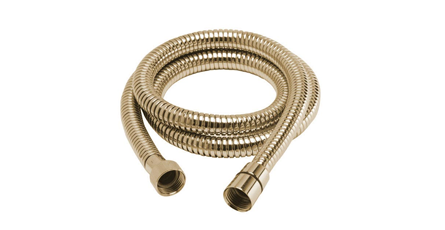 Shower hoses come with a variety of connector options including the most common size 1/2" BSP and BSP thread connections, You'll also need to know your bore size; standard bore size is 8mm although there are 10mm and 11mm options which can also be double woven. Speak to a member of the team if you're unsure about your shower hose connection. This is a good quality item that looks nice in my bathroom. Good sturdy hose. Like the way the screws at each end to tighten onto shower fitting are textured so easy to turn even with wet fingers. Unlike many hoses this is smooth so will not collect soap debris & so is easy to clean.